Doomfist is the newest hero to be added to Overwatch and he packs quite the punch. He is a highly mobile, offense hero, able to dive into the enemy backline and cause chaos. As a hybrid hero who utilises ranged attacks with his Hand Cannon, before entering into melee range through a combination of abilities (notably Rocket Punch) he's undoubtedly unique. Although Doomfist lacks the ranged prowess of heroes such as Soldier: 76 or McCree, he makes up for this in his ability to box players within confined spaces. Rocket Punch is exceptional for battering lone heroes against scenary, while the AOE damage (and minor pull) of Seismic Slam offers some group pressure. I suspect it will be some time before we see Doomfist played competitively and while the current dive meta might sound appealing for his kit, I'd actually state that he excels more when he can wait and then dive into combat. He lacks sustain (despite his Passive shielding) and works better with heroes such as Zarya and Reinhardt than D.Va and Winston. 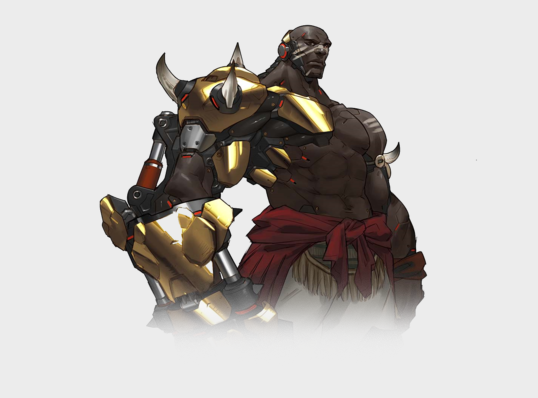 Having played Doomfist on the PTR since his release, his Ultimate ability is likely what will see him drafted as it affords him and his team exceptional AOE damage. However, I will forewarn - he has a high skill ceiling and you should expect to die a great deal over the course of learning his strengths and limitations. The Best Defense... (Passive) - Doomfist's Passive allows him to generate personal shielding. The shield is obtained by landing your abilities, and decays over time. He gains 30 shields per enemy hit with Seismic Slam, Rising Uppercut and Rocket Punch. He also gains 75 shields per enemy hit up to a maximum of 150 from Meteor Strike. These shields decay at a rate of -3 per second, and won't sustain you indefinitely. What his shielding does afford him however, is greater sustain in 1 on 1 encounters or - if he lands his Ultimate - enough time to escape. As noted, unless you're reliably landing your abilities against opposing players, your Passive will remain redundant. Hand Cannon (LMB) - Doomfist's primary fire allows him to shoot a short-range shotgun burst from his knuckles. These cannot be reloaded and instead, they automatically reload over time at a rate of 0.75 shots per second. Considering that his rate of fire is 3 per second, you can quickly burst your four shots, but will then need time to regain your ammunition. Although your Hand Cannon has a very small spread, it can be challenging to land all your shots, especially against fast moving targets. It's also worth noting that due to the automatic reload, you need to ensure you always have full ammo when roaming or before engaging in a fight: that last pellet might secure a kill. Seismic Slam (E) - When activating Seismic Slam Doomfist leaps forward, slamming the ground, breifly stunning and pulling those caught slightly towards him. This ability has a fairly long animation time, making it difficult to use at the exact moment you might need it. I'll also add that when used on the ground, there's no telegraph of where your slam will strike but in the air, this is clearly visible. Ideally you want to be engaging with Seismic Slam so that you can then utilise Rising Uppercut > Rocket Punch > Hand Cannon for a multi-hit combo. Rocket Punch (RMB) - Key to Doomfists ability to engage and escape is Rocket Punch. With the distance and damage you travel based on how long you hold down your right mouse button, it's often best to try to engage when it's fully charged. At times, a simple tap of RMB will ensure you zip fast enough to charge a short distance, before finishing someone off. In addition, if you time it quickly you can juggle a player caught by Rising Uppercut with a quick Rocket Punch to the face (followed by your Hand Cannon). Just be aware that if you dive deep with Rocket Punch against the enemy team, you'll be killed incredibly quickly. Rising Uppercut (LShift) - As your only form of crowd control, Rising Uppercut grants Doomfist a knockup. Typically you'll send one player into the air, but if two are close together, you can knock two up at the same time. Rising Uppercut only has a very short range, so it's best to use it after Seismic Slam, or when a player is immediately next to you. It's also worth noting that on using Rising Uppercut, Doomfist hangs in the air slightly. This is to give you enough time to use Rocket Punch, before finishing with several Hand Cannon shots. Be conscious of the fact that if you miss Rising Uppercut, your time in the air leaves you vulnerable to counter-attack from ranged heroes, and makes you a particularly easy target. Meteor Strike (Ultimate) - Doomfist's Ultimate ability allows him to leap into the air, becoming untargettable. After a short time (4 seconds), he lands at his chosen location, dealing massive damage to enemies hit, before knocking them back. This is an amazing ability for dealing with closly clumped teams. In a pinch it can also be used to keep yourself alive, as you are immune to all damage during its cast time. It's also worth noting that Meteor Strike provides Doomfist with the highest return on his protective shields, granting +75 for each hero hit. If you can, try to hit at least two players for maximum shields. Doomfist has a complex kit that requires patience and practice. For the most part you should be flanking and hanging back, and looking for avenues where you can quickly enter into - and exit - combat. If you engage too early with Doomfist, you'll be focused and killed. What's important is to not only deal damage with your Hand Cannon, but to then leap into a fight with Seismic Slam. This will not only give you a reasonable amount of shielding, but ensure any subsequent abilities keep you topped up. I'll also add that Doomfist requires a great deal of patience to be effective with, but also a composition that aims to sustain him rather than dive with him. Reinhardt and Zarya make exceptional partners because they can mitigate damage he might receive. Even Zenyatta is particularly good for Doomfist as he ensures that regardless of where he is, he's able to receive a heal. Try to always aim for targets who have low health pools, or who are already low health. A successful engage with Seismic Slam can often deal enough damage to kill anyone partciularly low, while you then still have enough abilities to retreat should you need to. Heroes listed here are particularly challenging for Doomfist. While those listed can still be killed, they pose a particularly difficult challenge for him so be sure to take extra care. Hanzo: His range and ability to climb walls make him very difficult ot reach. If you do reach him however, he can be easily killed. This list of tips and tricks are just a handful of things we think will help your Doomfist play. We'll continue to add to the list as required and if you have any tips you'd like to share, let us know in the comments below and we'll place them here. 1. Doomfist's Passive shielding is only gained when he makes contact with his abilities. 2. Landing all your abilities (excluding your Ultimate) against a single target provides +90 shielding only. It decays at -3 shielding per second. 3. If possible, try to maintain melee attacks against a single player so that you continue to stack your Passive. 4. Your Hand Cannon has no fall-off damage and near infinite range. You can poke with it, but be sure to have ammunition ready for when you need to engage. 5. Your Hand Cannon reloads fairly slowly, but also delivers rapid shots. When juggling someone with Rising Uppercut, you can freely land two or three while they're in the air due to its speed of delivery. 6. Seismic Slam deals increased damage the further you travel. Ideally you want to deal damage from as far away as possible, usually by leaping from a building down onto the ground. 7. Seismic Slam shows the telegraph of its impact only when you're in the air. Use this to position your landing for maximum effect. 8. Seismic Slam's damage is based on the telegraph in front of where you land, not on your point of impact. Take this into account when lining up damage. 9. Rising Uppercut can hit 2 targets but only if they're close together. If you know you're going to be fighting in a confined space, be sure to unleash it. 10. Rising Uppercut has an incredibly small range, so be sure to be close to enemies before you use it. Missing it can cause serious problems for your ability to chain attack a player. 11. Rocket Punch's damage and distance is based on how long you charge your attack. Ideally, the longer the better, but a quick jab (simply tapping RMB) can have value if it means you knock a player into scenary. 12. The trajectory of a fully charged Rocket Punch is enough to propel you over gaps, as long as you start on higher ground. 13. Rocket Punch's damage and distance charge quickly before it slows down. Its charge power is indicated by 4 bars on the UI. 14. Rocket Punch can move through barriers, allowing you to hit Orisa and Reinhardt even if they think they're protected. 15. Even if used indoors, Meteor Strike will still remove you from play. You can change your viewing angle by holding down RMB. 16. The enemy team can see your damage indicator only when you're about to land. 17. You're completely invulnerable to all damage during Meteor Strike. 18. Poke, poke, poke as Doomfist and buy your time before engaging. Entering into combat early will see you focused and killed near instantly.